Ian Macleod Distillers has unveiled a six-week long activation in Glasgow International Airport for its Edinburgh Gin brand. The Scottish gin maker has launched its Do Your Gin Thing concept in the international airport, offering travellers the chance to sample its range of gins and gin liqueurs. The activation features bespoke shelving, a large screen and a branded bar, which will be staffed by ambassadors on hand to teach consumers about the brand’s portfolio. Ian Macleod Distillers global travel retail director, William Ovens, said: “We are excited that our new Edinburgh Gin Do Your Gin Thing activation is live in GTR for the first time and proud that it is taking place on home soil. At the bar, travellers will be able to sample Edinburgh Gin signature serves, including Edinburgh Gin Rhubarb and Ginger Liqueur & ginger ale and Edinburgh Gin Fizz, which is made from Edinburgh Gin Rhubarb and Ginger Liqueur & Prosecco. The company estimates that over 20,000 samples will be distributed during the activation period, which runs until the end of October. 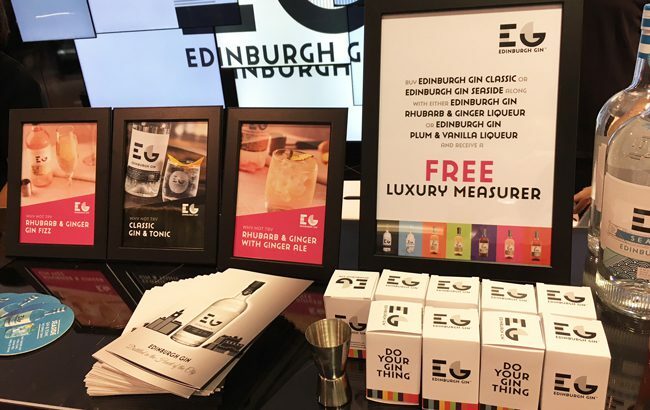 As part of the installation, customers will receive a free branded spirit measurer when they buy a bottle of Edinburgh Gin Liqueur with a bottle of either Edinburgh Gin Classic Gin or Edinburgh Gin Seaside Gin. Alongside the activation, the Scottish gin brand is taking over the 14 metre advertising lightbox panels at Glasgow International Airport departures area from now until the end of the year.